Pullman takes care of you – head to toe, body and mind. The Nang Spa is a haven of well-being and serenity that offers a wide range of massages, bathing rituals, facials and body treatments. Methods are based on both traditional and modern holistic practices. Reflexology and massages promote inner peace and harmony. Wraps pamper the body, and scrubs reveal the skin’s radiance. On top of luxurious treatments, guests of Pullman Danang Beach Resort get free access to the steam room, sauna and plunge pool. Retreat, unwind, revitalize… This is your time-out zone. 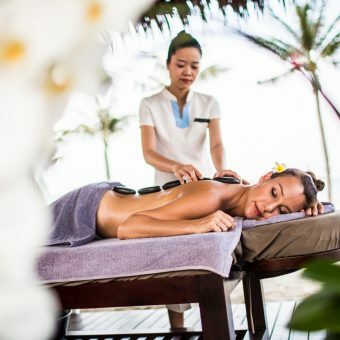 This signature treatment invites guests to enter into a world of bliss and energy. Inspired by ancient massage rituals, it combines the holistic healing effects of seven different techniques for profound results. The session opens the energy channels and stimulates nerve endings and muscles – releasing stress and improving flexibility. The body is relaxed, revitalized and ready for more holiday fun in Danang. In a peaceful Nang Spa treatment room (60 or 90 minutes) or directly on the beach (90 minutes). Whatever the desired effect, this signature Nang Spa treatment provides it. Relaxation, revitalization, rejuvenation… A choice of three aromatic oil blends, combined with healing massage techniques from the East and West, helps spa goers find peace and balance. In a tranquil Nang Spa treatment room (60 or 90 minutes) or directly on the beach (90 minutes).